C1428. 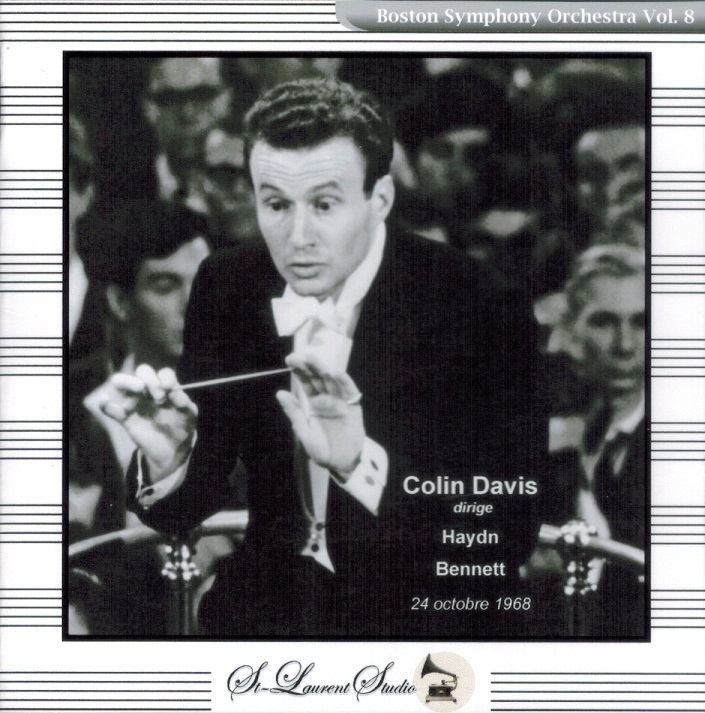 COLIN DAVIS Cond. Boston S.O. 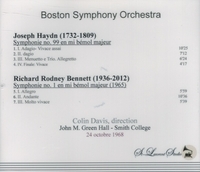 : Symphony #99 in E-flat (Haydn) Symphony #1 (Richard Rodney Bennett). (Canada) St Laurent Studio YSL T-333, Live Performance, 24 Oct., 1968, John M. Greene Hall, Smith College. Transfers by Yves St Laurent. “Richard Rodney Bennett, the British composer who in a long, distinguished career moved with ease among classical concert music, jazz and film, wrote three symphonies, 17 concerti, five operas and dozens of elegant chamber works in a style that fused the avant-garde theories of Pierre Boulez, one of his teachers, with his own flexible, lyrical, nondogmatic approach. His taste had this wide range from the time he began listening to music on the radio as a child. ‘When I came across something I liked’, Mr. Bennett said in an interview with THE GUARDIAN in 2011, ‘I wanted to find out as much as I could about it. This was as true of hearing Hoagy Carmichael for the first time as it was later when I first heard Boulez. Being on a musical quest was something I always enjoyed’. ‘I just scribbled away and eventually a C major chord was there’, Mr. Bennett recalled. By the time he was 18 he had written three string quartets, and a year later he had finished his first film score. He entered the Royal Academy of Music in London in 1953….A scholarship from the French government gave Mr. Bennett two years of study in Paris with Mr. Boulez. In a review of a revival of his 1965 opera, THE MINES OF SULPHUR, at the New York City Opera in 2005, Allan Kozinn wrote in THE NEW YORK TIMES that Mr. Bennett ‘adopted 12-tone techniques to create angular vocal lines and spiky textures’, and added, ‘But he was not after harshness as such: often his vocal lines soar, and they are supported by a vivid, lush and constantly moving orchestral score’.